The aquamarine waters of the Caribbean Sea — and a shipwreck, to boot! Snorkeling and scuba diving are both activities I’ve wanted to try for some time, but for some reason I hadn’t gotten around to doing either — until earlier this month, that is. On the third day of a five-day trip to Cancún, my girlfriend and I put our swimsuits on, climbed into the shuttle waiting outside our hotel, and headed off to the Punta Norte Marina to get our underwater adventure underway. 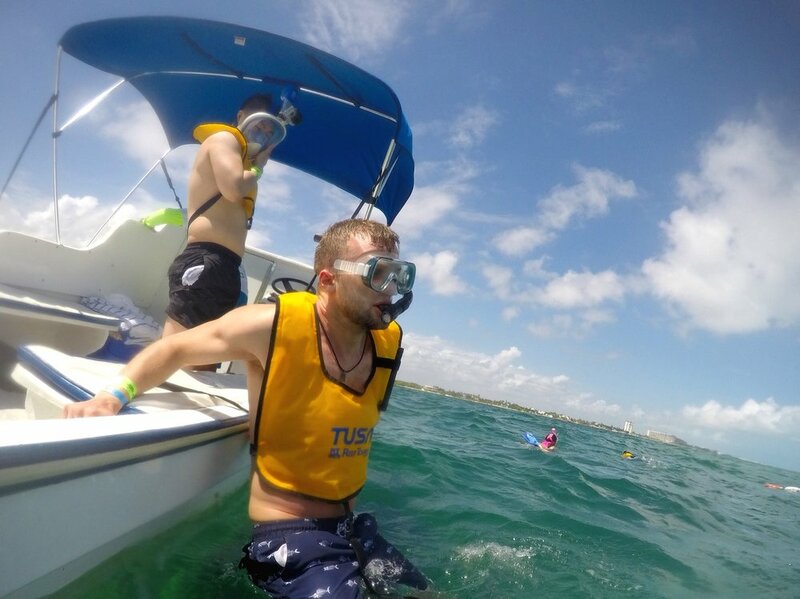 It would be the first time snorkeling for both of us, which is why it was definitely a good thing that we were in the capable hands of the staff at Total Snorkel Cancún. Our instructor, Jorge, let us do a little practice run near the dock before getting on the boat with the others and then lent us a hand once we were actually out in the water, making sure we felt comfortable and safe every step of the way. The hardest part for me was concentrating on breathing through my mouth instead of my nose. Once I got the hang of that, though, it was pretty smooth sailing. Our experience was documented by another member of Total Snorkel’s staff, and thanks to him (and the $45 we paid the company for the photo/video package), here are some of those shots. The ride from the dock out to the first of three stops on our snorkeling tour — the Reef, Musa, Turtle Encounter and Shipwreck Cancun Snorkeling Tour, to be specific — took less than five minutes. After that, it was time to jump right in. No shame in admitting that we both clung to life preservers during the first two portions of the tour; better to be safe than sorry, after all. Find some tips for beginners right here. Our tour was pegged for all skill levels, but Total Snorkel Cancún also offers a tour for non-swimmers and a moonlight package for those who already know what they’re doing. Our second stop brought us to Museo Subacuático de Arte, an underwater art museum only a short way off shore. Though we saw only a few of its “exhibits,” the museum consists of over 500 permanent sculptures and aims to demonstrate the interaction between art and environmental science. 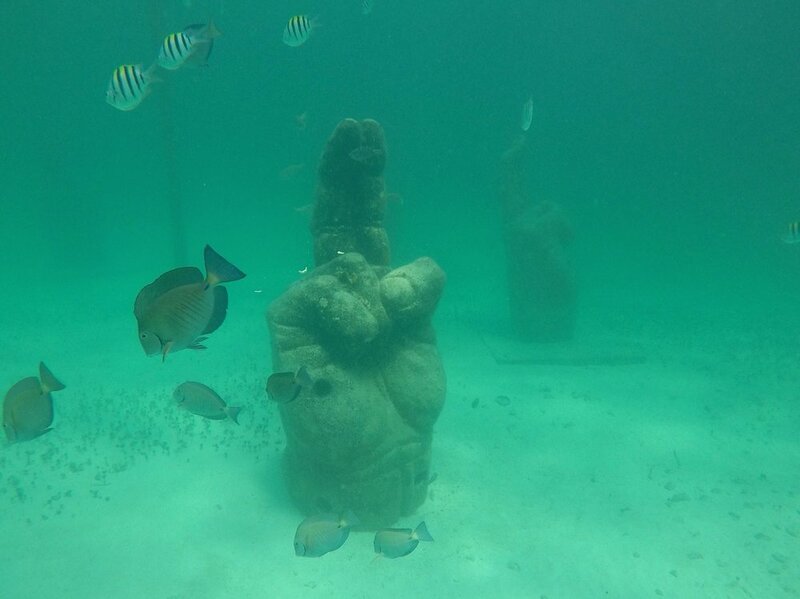 In addition to the tour available through Total Snorkel, there are several other ways to view the underwater museum. The museum’s website lists eight, in fact, including a handful of scuba diving options and a ride in a glass-bottom boat. We were fortunate enough to spot a sea turtle during our tour — and a rather large one, at that. As they are endangered, there are a number of initiatives being undertaken to preserve and protect them. 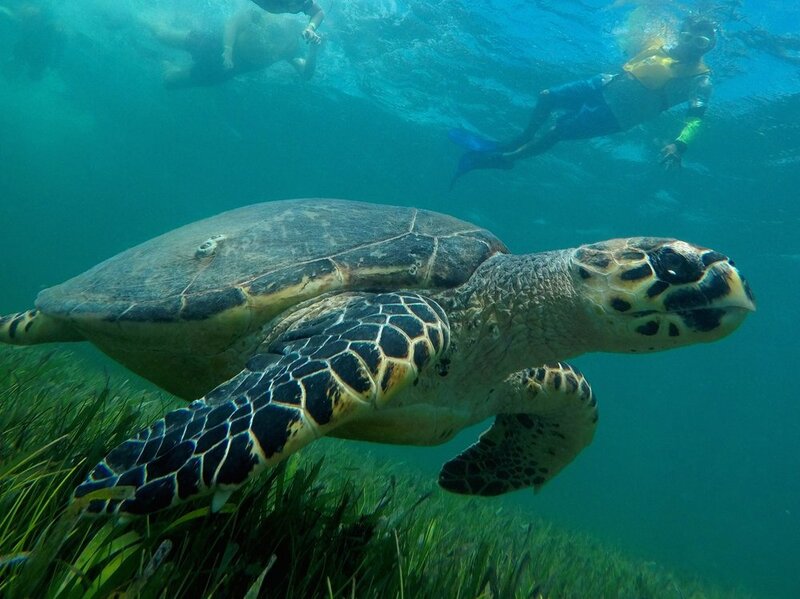 For example, many resorts include sea turtle-oriented activities and education for their guests. For our final stop, I ditched the life preserver and swam around on my own near the shipwreck. It was definitely neat-o, gang, but the water started getting a bit choppy at that point, too, so I eventually retreated to the boat. Not before our personal photographer/videographer could capture this shot, however.